To say the least, it was worth waking up early and without having the separation anxiety from my warm bed, we love the experience, totally out-of-the-box idea. 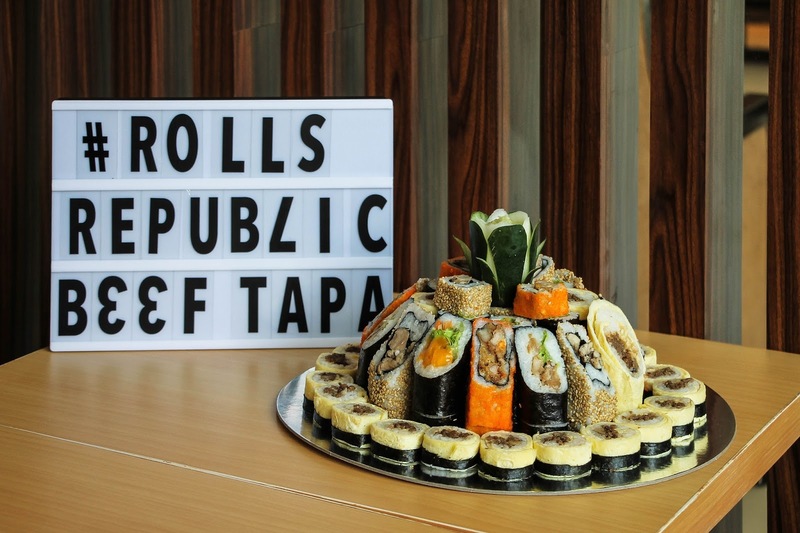 The concept of Rolls Republic is meshing Pinoy flavors with Maki sushi. The owner herself love sushi rolls but thought of her market well when she was conceptualizing her brand. Her target is for the local Filipinos to enjoy sushi rolls without having to eat raw fish. 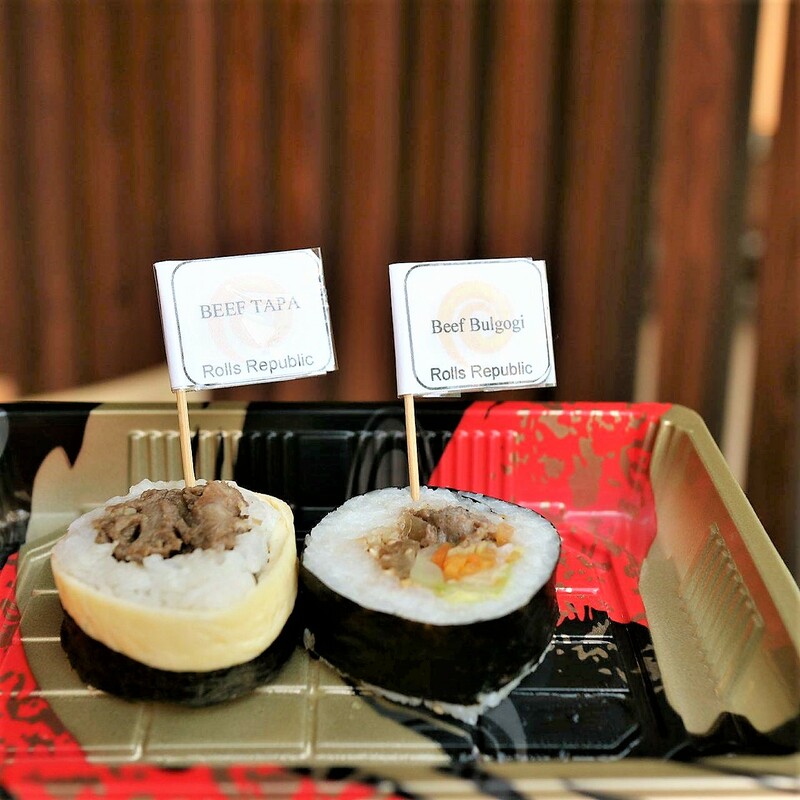 As we all know, talking on behalf of foodies, there is complexity in between sushi and maki. Sushi is any dish that has vinegared rice (“Sushi Rice“) combined with other ingredients such as seafood and vegetables. Some people think sushi means RAW fish and sushi rice is a type of short-grain Japanese rice, but they’re not. 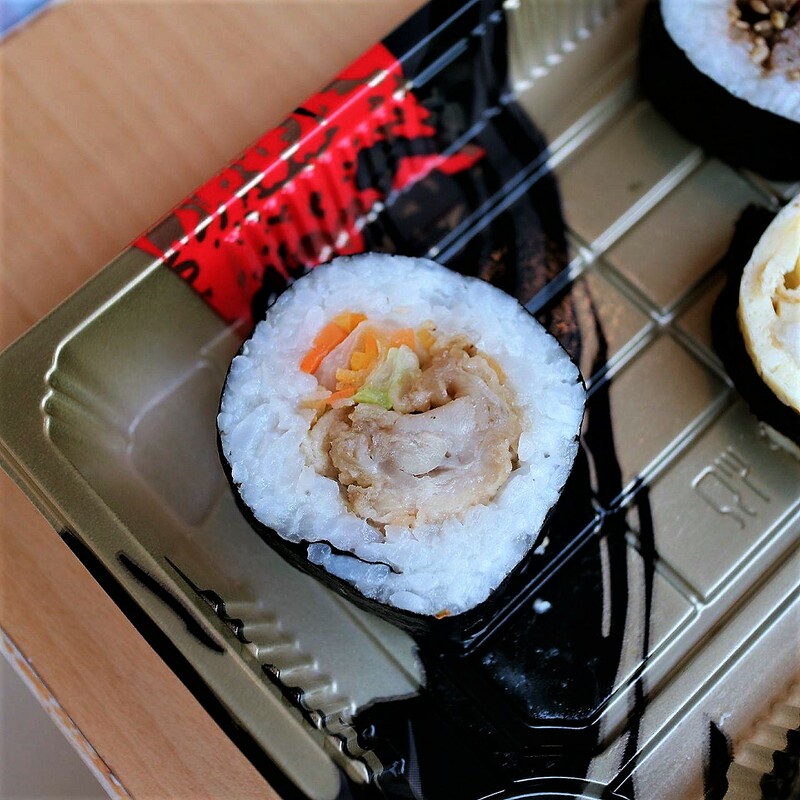 When the sushi rice is wrapped in nori (seaweed) and rolled, it is then called a Sushi Roll. In Japan, it is widely known as Makizushi or Maki Sushi. Rolls Republic had segued from the typical Japanese, nor Western-style (Californian) sushi rolls, but stayed true to the traditional technique in making it. Thanks to their creative chef, who used to work at Yakimix. 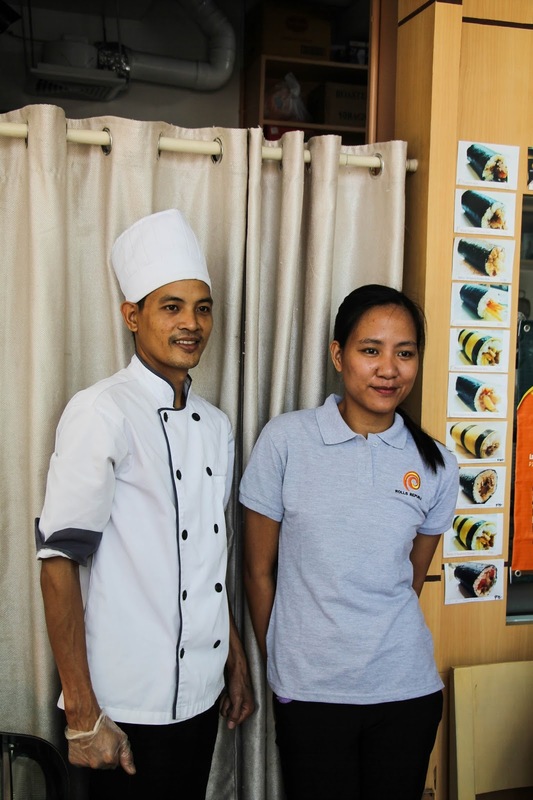 Her market isn't for the typical sushi rolls customers, particularly the raw fish eater. That's one reason why they opted to use "rolls" instead of sushi or maki. 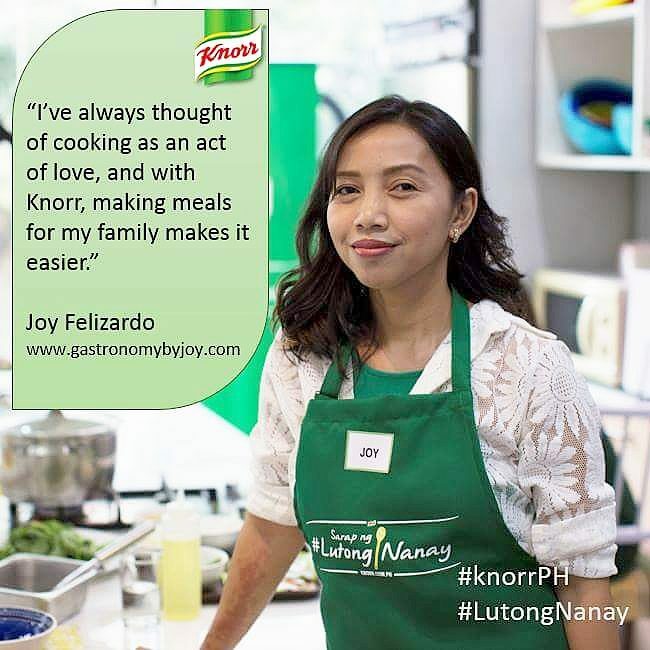 Aside from using nori sheets, they also use thin omelet and burrito, that's to say that aside from the famous Filipino dishes they had incorporated into the rolls, they also have other Asian flavors. Their unique selection of rolls will blow you away, as their tagline is "Kanin at ulam sa isang hawak." 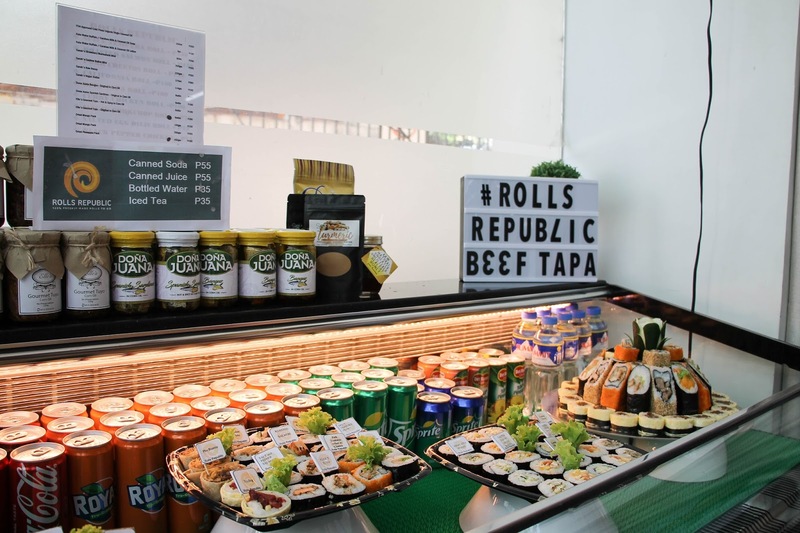 Another thing I like about their rolls and concept is that they source locally, with their vegetables coming from Bagiuo and their vinegar-infused rice isn't at all Japanese or Jasmine rice but a mix of malagkit and Dinurado. Their rolls are categorized as best-sellers, pork, seafood, vegetable, chicken, beef and all-day breakfast. 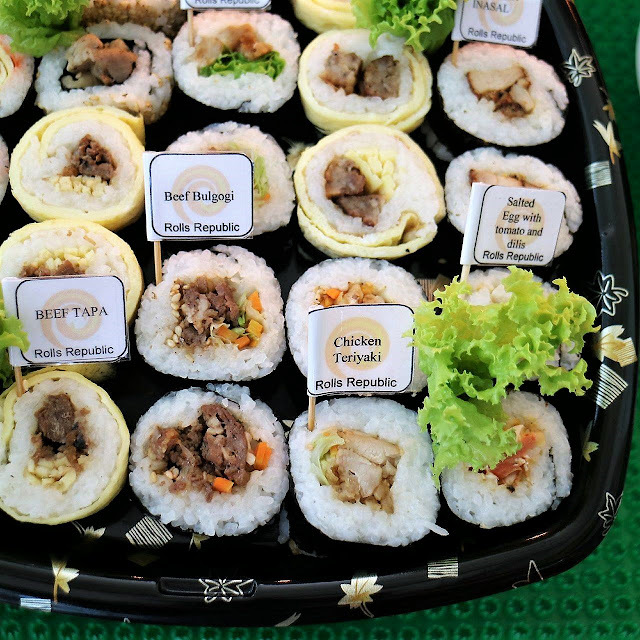 Some of the elements rolled are beef tapa, salted egg, tortang talong, kimchi, beef bulgogi, pork Macau, chicken inasal, and unique twists such as phoburrito, using tortilla as a wrap and the Summerlicious with veggies wrapped in rice paper. There's a whole lot more! 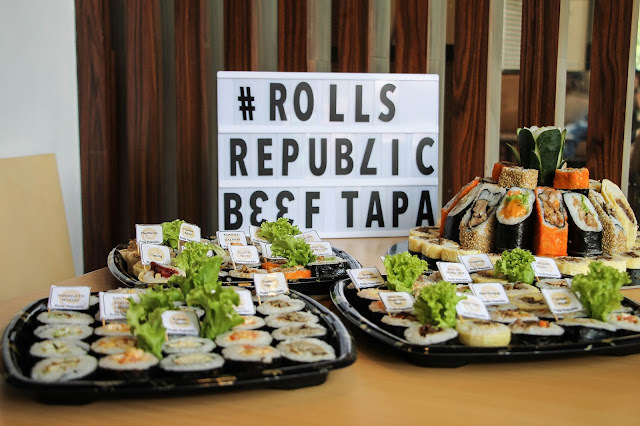 Last Sunday, Rolls Republic turned 1 and to roll out a rockin' promo in their celebration, they made the Speedy Rolls Festival: Eat all you can affair to remember. The buffet will only run every Sundays, which started September 17. Up to October 8. 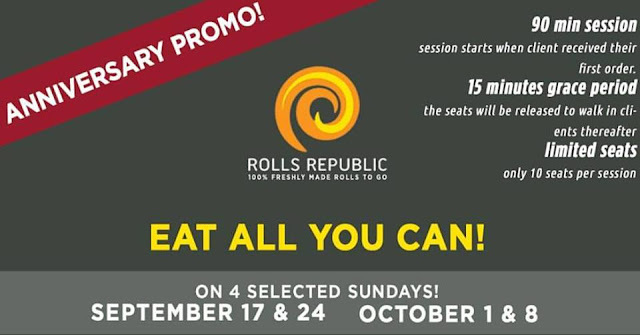 Thus, there will only be three more Sundays to book your rolls buffet experience. Make sure to call and book your scheduled time, as seating is limited as well. They only have 6 slots per day. 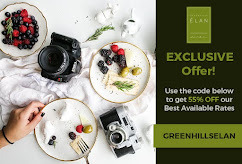 To get the full view of their rules for the buffet, visit their Facebook page. 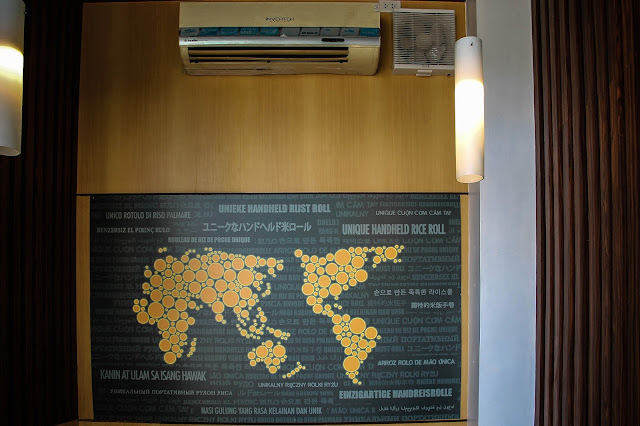 On your visit, familiarize yourself with their selection by flicking over their menu or checking out the display area, which is on the left side upon entering. Once seated you will be given a paper and pen. You then choose your option. 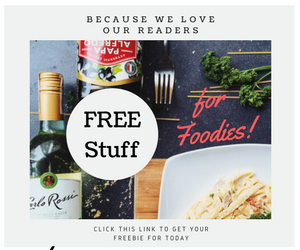 This would suggest the variety you want and the cost of your buffet. Each selection is a cut roll with a filling of your choice that's bite-sized already. 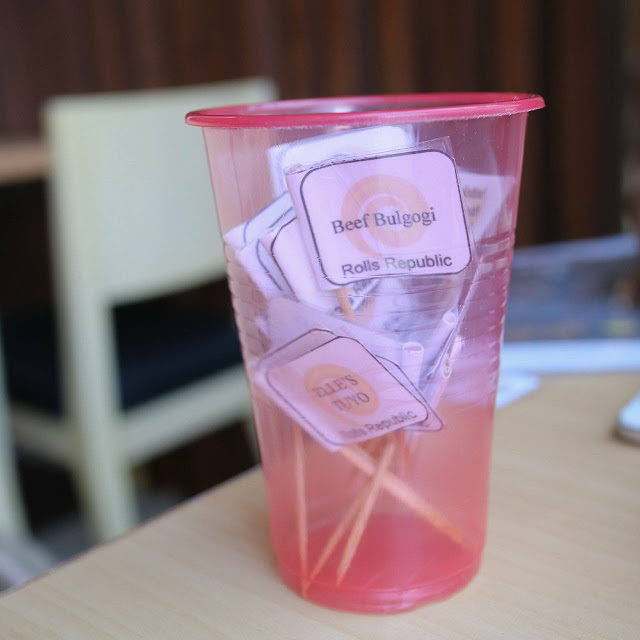 Below every OPTION, you need to check the flavor and how many servings per flavor. 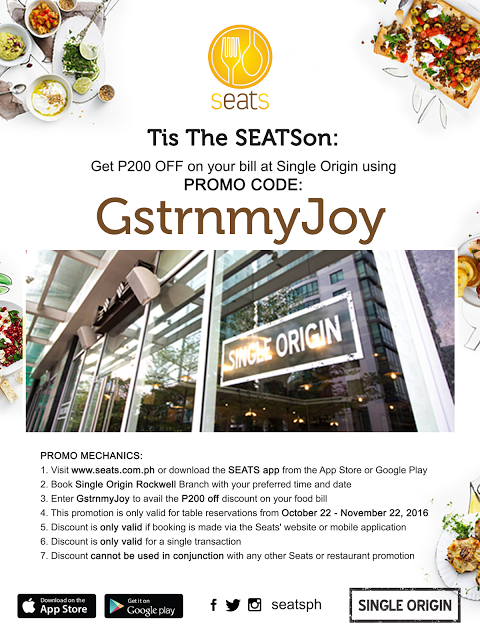 The costs vary from P 150 up to P 300. HERE is our TIP: Choose and TICK OPTION D, so you can try everything on their menu unless you're a Vegan or vegetarian. 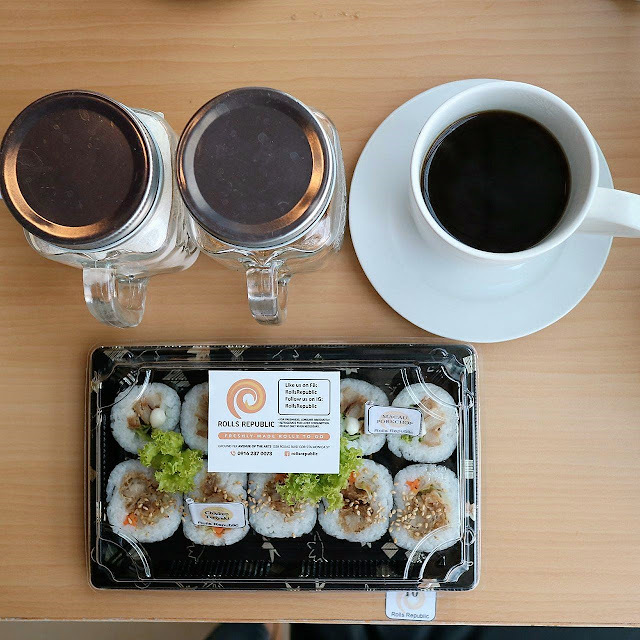 Just order 1 item per flavor so you don't get stuffed easily, as it may tend to get heavy on the tummy over some few rolls since it's mainly rice. Anyhow, you can go over and order more, but make sure not to leave any un-eaten as you'll be charged for LEFT-OVERS. For a more pleasurable and complete experience of Rolls Republic, upgrade your meal option by adding P 50 if you want a salad and soup for the day or both for only P 75. 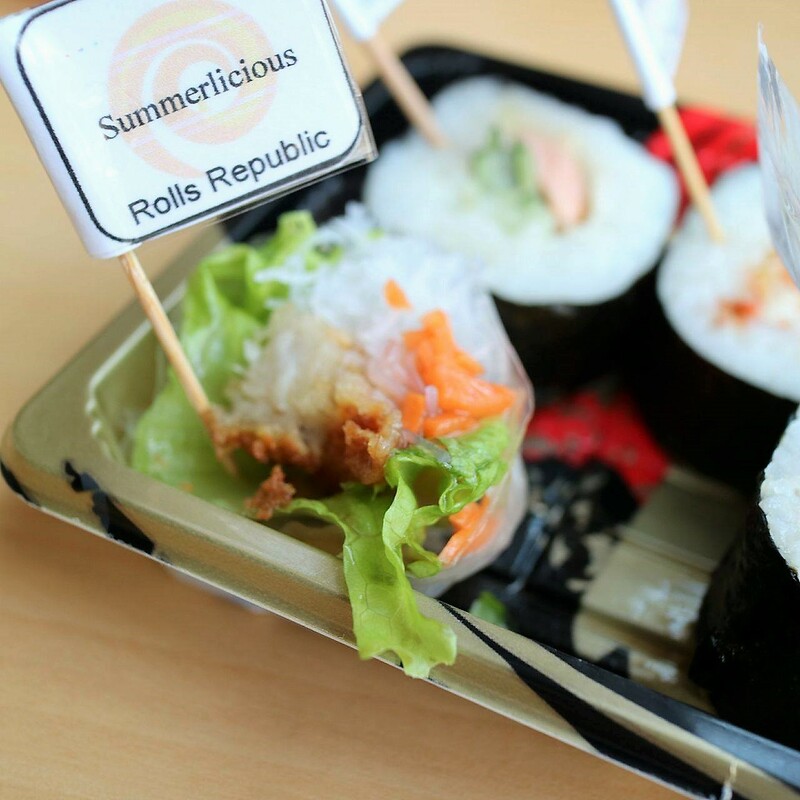 Summerlicious, crowd-pleaser to those who are after healthy and non-meat rolls. Since we ate a lot of the All-day Breakfast options, we had hot coffee from Sagada to go with it. 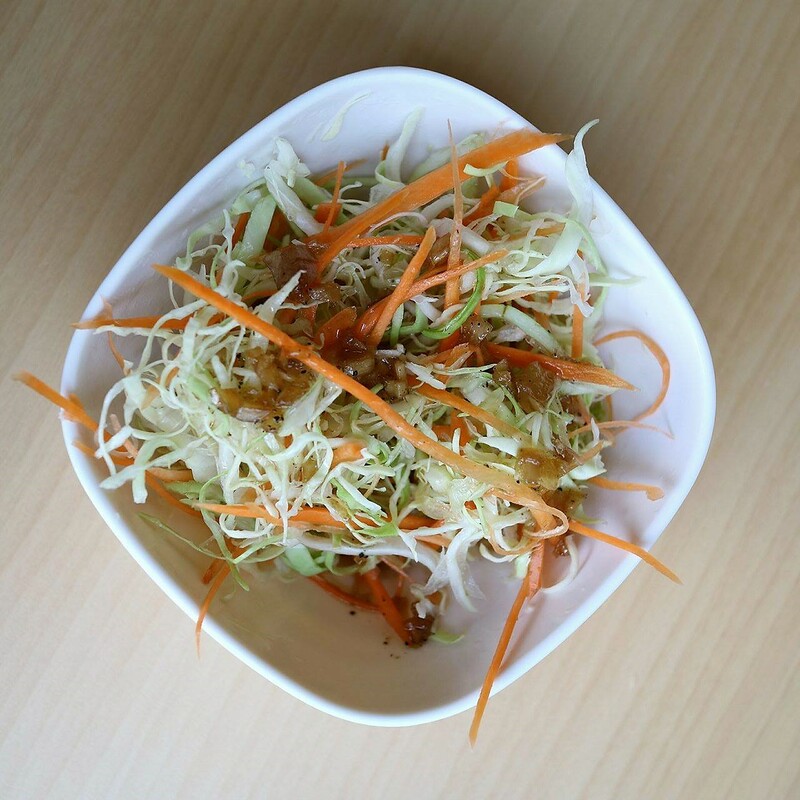 Their combo meal is such a steal as well for only P 70, you can have a complete meal with soup salad and roll. Apart from the buffet, they also make flower roll on special occasions, or you can pre-order this and have it delivered. don't you think it's a good idea to gift this to someone? Or how about celebrating with Maki cake. 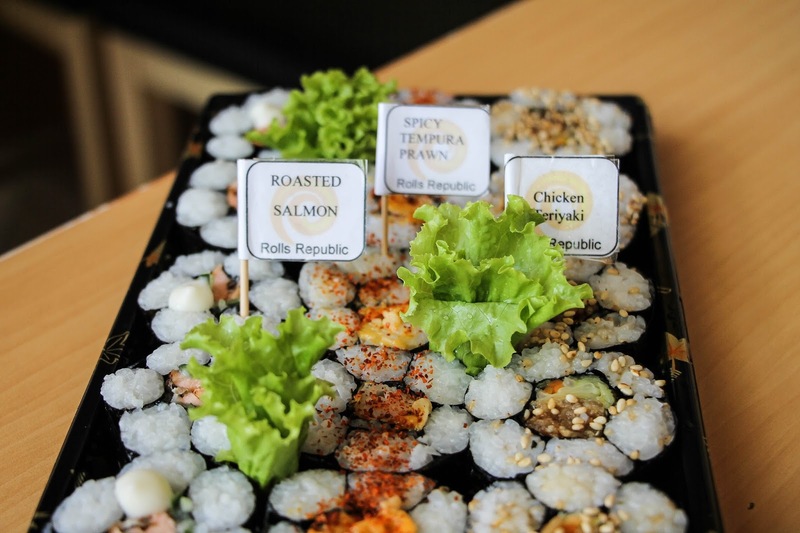 It's a tray full of different kinds of Maki beautifully made. I hope it's my birthday already, coz I really don't mind having this and blowing candles on top of this towering yumminess. 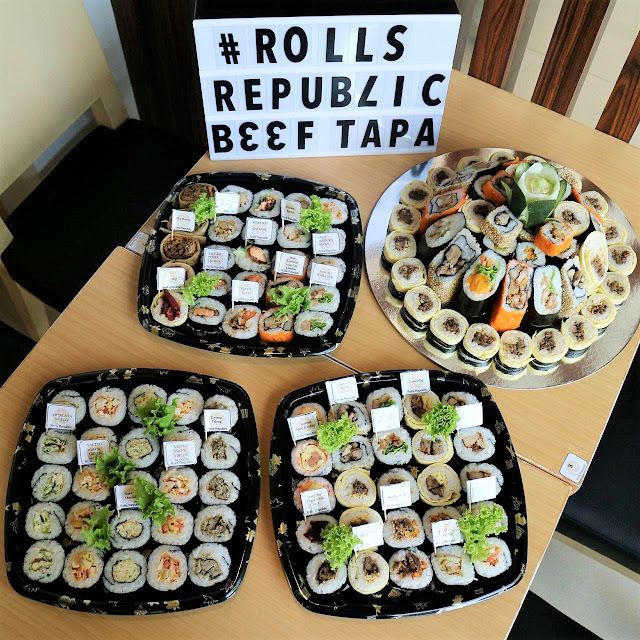 The owners are so brilliant having to craft the idea of these Pinoy Rolls, not only do we get to enjoy different global flavors in one seating, we also get to enjoy a borrowed culinary art from Japan. For a buffet, it's really worth all the penny!